Is it coming tomorrow? House Democrats are still holding the line on denying President Trump his border wall. The $5 billion proposal led to the current shutdown, now the longest in American history. Trump wants to at least get part of the border wall built. Democrats are not in a bipartisan mode. They just retook the House on the overarching promise to fight this White House not work with it. As the two sides dig in, the crisis at the border is worsening. Yes, we do have a crisis on the southern border. The Washington Post and The New York Times reported on it. Former President Barack Obama even said there was a crisis. With another migrant horde setting off for the U.S. border, something has to get done. 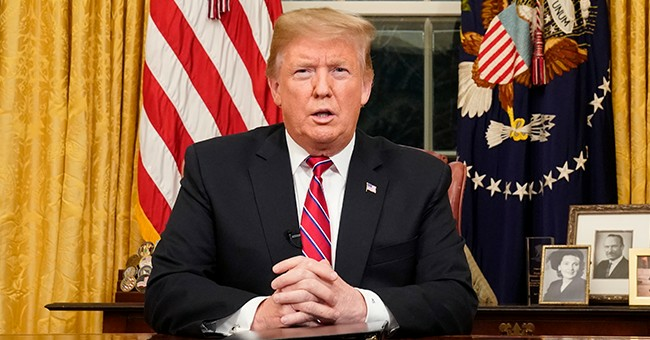 The president has been mulling declaring a national emergency to get it done, which isn’t facially unconstitutional, according to law experts, though how he would collect the funds to build this wall is another legal can of worms. Whatever the case, it seems now, with no deal in sight, Trump is preparing to declare a national emergency. We’ll find out for sure tomorrow around 3 P.M, but the president said that it will be about the crisis at the border. The national emergency declaration to build the wall — which has looked like the most likely end to the shutdown for almost two weeks now — probably won’t accomplish what Trump wants. But it gets everyone out of a shutdown without anyone having to concede. Now, it could be that, or it could be a massive head fake. We shall find out soon. Stay tuned.